One of the first, and by far most important, things you consider when you start decorating a space is the paint color. It sets a tone of the room, establishes a palette for you to layer in your furniture and preps for what kind of story you would like the space to tell. As much as I still swear by my black accent walls, here are my current top 5 paint colors. These are colors I've used and loved throughout the years ones that have proven to be timeless, grow with you… and, of course, are not black. I cannot say enough about this paint color by Portola — I am completely in love with it. I’ve used it in my pottery studio to create a textured “venetian paint” effect. It turned out so beautifully that I took it into our own house and repainted our dining room with this paint. FARROW AND BALL IN “RAILINGS"
Black, but with a twist. Who says you can’t have fun with black? The subtle blue undertone makes this color the perfect alternative to the daunting black. I love this in a study room or used for a beautiful statement door. We used this color in the kitchen of our old townhouse in New York City — it paired so beautifully with the metal accents. If you take a look at any white wall in our current home in Los Angeles, you’re looking at Benjamin Moore’s “Alabastor”. This is my go-to off-white classic. Contrary to popular belief, whites (and lighter colors) are easier to keep clean than darker colors. This goes without saying, but you can pair it with everything and anything, and looks even more beautiful on it’s own. Elegant, timeless and chic. FARROW AND BALL IN "DEAD SALMON"
You asked for color, you got it. Here’s a color I’m obsessed with. 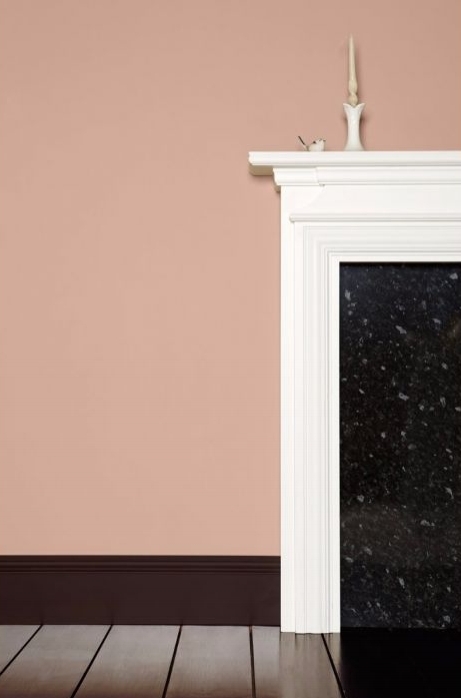 This deep salmon hue is beautifully serene, the perfect neutral it is subtle enough to be in any room from bedroom to dining room. Muted enough to complement any palette but bright enough to make itself known when you enter the room. BENJAMIN MOORE IN "SMOKEY TAUPE"
An all-time favorite. Benjamin Moore’s “Smokey Taupe” is one of those special colors that transitions with you. It is timeless and transforms into the ambiance of whatever room you choose to place it in. A fool-proof neutral. See it in action on our kitchen island here in our feature in Architectural Digest.